We take a different route on this Weekly Walk. Rather than focus on notable Twitter and Facebook posts, today we list a handful of resources people can use to assist victims of Hurricane Sandy. Red Cross: They provide food and shelter and accept donations via their website. Make a $10 donation by texting the word “Redcross” to 90999. They are also requesting blood donations at the New York Blood Center, which can be reached at 800.933.2566. Humane Society: They dispatch rescue teams to search for displaced animals, and they provide food and shelter. Owners needing to be reunited with pets lost during an evacuation should call 347.573.1561 for information. Make a $10 donation by texting the word “Animals” to 20222. Feeding America: As stated in their recent blog post: “ ‘It is our responsibility to ensure preparedness for disaster response and relief, so that we can move food to affected areas as quickly as possible — and stay as long as our help is needed,’ said Matt Knott, interim president and CEO of Feeding America. ‘We are there to offer support long after these disasters disappear from the headlines.’ ” Donate via their website or by calling 800.910.5524. Salvation Army: From their website: “The Salvation Army is serving those impacted by Hurricane Sandy in the Northeast and Mid-Atlantic with food, clean-up kits, as well as emotional and spiritual care.” Visit their webpage to donate. Global Animal Foundation: They use donations to send rescue teams into impacted areas and to pay for pet medical expenses, food, and shelter. They are also making efforts to reunite pets with their owners. Facebook North Jersey Support: This page provides questions and answers for those living in the area. Please visit the page if you believe you can answer questions posted by others in need. Facebook South Jersey Support: This page provides questions and answers for those living in the area. Please visit the page if you believe you can answer questions posted by others in need. Facebook Hurricane Sandy Lost and Found Pets: This page aims at reuniting pets with their owners and offers additional information about where to find animal assistance. Many people have stepped in to help, but more aid is always welcome. If you have proper shelter in any of the areas affected by the storm, you might offer an extra room, food, showers, clothes, or other items to victims. Even sharing information where people can receive help is a step in the right direction, so please share any details you have in the comments below, on Twitter, or Facebook. We will be sure our readers and followers see it. Thank you and woof. 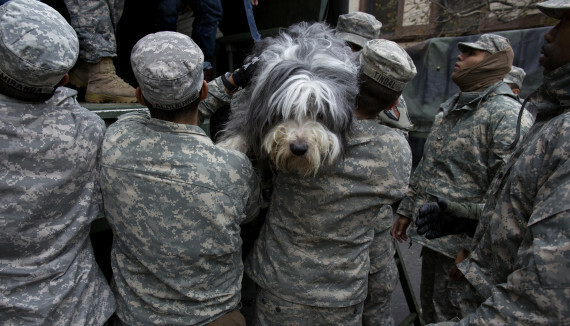 The Huffington Post has a short slideshow of rescued animals. Click the photo for more. Welcome to the Chicago Dog Walkers Reader. We plan on using this space to write about all manner of pet, animal lover, and Chicago Dog Walkers topics. Appropriately, we’re kickstarting the blog by interviewing two walkers, Mike Russell and Matt Lemke of the band Suns, about their experiences using websites like Kickstarter to bring their music to a wider audience. We also chat about dog walking and singing while you work. Kickstarter fosters the idea of community-sponsored art; artists only receive funding for their projects if they find enough supporters to donate. This seems like an unorthodox approach to produce an album. Why did you guys decide to travel this route with your upcoming first album, When We Were Us? Was everyone on board from the start? Mike Russell: Just to stay as independent as possible. We’ve been in situations with record labels and management and stuff before that didn’t really … that environment doesn’t foster as much creativity as you can if you’re on your own. Matt Lemke: It was a pretty mutual decision between all of us. Basically we’re all really broke. That’s another big thing. We have friends that used it. A band that’s never really done anything, and they needed money to get going to get their first EP. And they raised money. We’d seriously be eating canned food for the next year if we had to pay for this. Which is still a potential. We might have to. What’s been the biggest advantage to joining Kickstarter? Mike: It’s kinda yet to be seen, but we are up to a thousand dollars so far and we’ve been doing it for ten days. That’s pretty good. We’re doing alright with it. We’ve only got twenty days [eleven days as of this posting] to get another four grand, but the biggest advantage is it’s working. Any downside to this community-driven approach? Mike: Not as of yet, but the only foreseeable problem is if we don’t meet the goal and all of those people who’ve donated will have to get their money back. They’ll be bummed out that they’re not going to get the record pre-ordered. With social media and websites like Kickstarter, you can get a project funded and produced with all of your marketing done for free. You can even perform via the Internet to connect with fans outside of Chicago. Does this take pressure off touring and building relationships while traveling, or is touring something the band enjoys and believes in having a physical presence as well as an internet presence? Matt: Absolutely. We all really like to be on the road. Forget all your bills and stuff. It’s good to build relationships. There’re some people that book our shows that we talk to through email—it’s good to finally get a face to the anonymous person. I think touring is definitely huge. Mike: Our main priority is to tour. I think everything that we do is predicated to getting back on tour. That’s all we’ve ever wanted to do. Facebook is useful. A lot of these social media sites are useful in promoting, but really the way you get people to come to your shows is by playing shows in their town. Mike: It usual evens out. We somehow manage every tour to get paid, at least some, from every show and we make ends meet. It’s always a good time. How has working with Chicago Dog Walkers, namely Marc and Denise, supported your band? Mike: Immensely. I don’t know where to begin. They’ve given us time off every tour. They’ve made it work. This was at a time—I’m subbing now—but a time when three of us had routes. So they’re filling three routes at a time for weeks and weeks. I’ve told Mark multiple times he’s the best boss I’ve ever had. The guy’s great. Denise is awesome. Matt: After being on the road for a while and coming home and being broke, I’ll kinda go with my tail between my legs to Marc. He’s never like, “You shouldn’t have gone on vacation.” He’s like, “Yeah no problem.” He’s like the dad I never had. How else has the job benefitted your careers as musicians? Mike: Free time. Walking around all day, I pretty much listen to whatever songs I’m working on to bring to the band. When we demo them and everyone’s working on their parts and stuff, everybody can have that time to walk around during the day and think about songs. Matt: My route’s up in Wrigleyville. We live in Logan Square, so between my house and my route, there’s ten to fifteen venues, and I’m passing out flyers, and there’s a Reckless [Records] on my route that I can stop at and drop stuff off. Kind of kill two birds with one stone. Would you recommend this to other starving artists looking for part-time work? Mike: I’d recommend this job to anybody. It’s awesome. Even in the winter. If you love dogs, there really isn’t a better job. Unless you’re looking for a ton of money. Matt: You can make a lot. Mike: Potentially. But you gotta get a huge route. Definitely. Do you sing to dogs while walking them? What’s a go-to tune for promenading with pooches? Mike: [laughs] No. I don’t think I’ve ever sang. Matt: I have. I’ve noticed as of recently that I have certain voices and things I’ll do with different dogs. Mike: I have Nicknames. I call Ruby “Rubetube.” You know, I might have sang to them a little bit. I don’t know. I’ve never thought about it. We sing to my dog all the time. She loves it. She have any favorite tunes? Mike: It’s kinda complicated. She kinda has her own song. I don’t really feel like singing it. Matt: She likes R&B. If you have a smooth voice. Hypothetical one for you: A client wants to pay you to play a dog party. Are you barking choruses or politely backing out with your tails between your legs? Mike: I’d play a dog party no problem. Matt: Definitely. As long as I can dress up like a dog. Mike: And if they had party hats. And they got to eat a giant dog cake. Who’s the drill sergeant when it comes to making sure everyone’s on time while touring? Who’s last to the party? Mike: We’re horrible. That’s the bad part about this band. We’re late to every show. We’re unorganized. Matt: The only time it kind of happens is if someone wakes up crabby and they’re like, “Hurry up.” Other than that, we stay up late every night and usually wake up around noon. Mike: It’s not the best way to travel but it’s relaxing. Disregarding donation amounts, which pledge package are you most excited about on your Kickstarter page? Are there any packages you considered that didn’t make the cut, but if someone offers the right price you would still be into giving? Mike: We joked around about for a thousand dollars bringing the person on tour. That I’d still do. We travel on a school bus. We have enough room. If someone was going to give us a thousand dollars I’d be down with bringing them out for a couple weeks. The one I’m most excited about is the potluck dinner, because that’s going to be awesome and fun and delicious. Matt: I like that too. I’m so willing to make food for strangers. Hopefully we don’t make them sick. Anything you want to add about Kickstarter? Mike: All we want to add is please consider donating. It’s a really good cause. We’re trying to do this an honest way. Any amount of money helps. Even a dollar. Whatever anybody can do would be really great. Thanks. Any words for current or future Suns supporters? Mike: Thanks for your support and thanks for being interested in us. It means a lot. It’s really important for us to play music. Anybody that supports that is a friend. Matt: And don’t be shy. Mike: Come talk to us at shows. Or on Facebook or Twitter or whatever. Suns are Mike Russell, Matt Lemke, Kody Nixon, Nick Enderle, Clinton Weber, Andy Schroeder. Speak with them on their Facebook and Myspace pages. Learn more about their Kickstarter packages. Read about a dog-walking experience from Kody. Matt Athanasiou writes poetry, nonfiction, scripts, love letters, notes, random words, and fiction, mostly fiction. You can read more about his words on his blog Let’s Pretend I’m Lying and follow him on Twitter @mattisnotscary.